Class Description - For menu click on the left side. This lusciously slow and meditative practice is the yogic prescription for chronic tension, feeling of overwhelm, long term physical imbalance, and exhaustion. It is the perfect compliment to more vigorous yoga styles and a great balancer for high stress living. Through the elegant combination of appropriate asana and gentle timing, Yin Yoga deeply stretches and nourishes the joints of the body, helping to generate much greater flexibility and core level relaxation. The poses and cues will challenge and inspire you. The relaxation is mindful and deep. The practice is designed to bring your Central Nervous System into a resting and restoring mode. Healing work at the cellular level can occur with digestion, muscle repair, scar tissue production, organ detoxification and emotional processing. Think of it as an efficient way to catch up on all that sleep you missed over the years. Yin Yoga sequences are often linked to Meridian theory, similar to the practice of acupuncture and can help open up and balance the body’s energetic pathway. This general yoga style utilizes the classical yoga postures and different sequencing depending on the instructor for the purpose of strengthening, opening and cleansing the body. In Hatha-style classes, the poses are held by the practitioner for varying lengths of time (depending on the instructor), unlike in vinyasa style classes where the poses are linked and create a flowing movement from one pose to the next. Please take note that this general style class is conducted in a unique way by each different instructor. So, Hatha with one teacher might not be the same experience as Hatha with another teacher. Students of all levels are invited to join these classes. Clear instruction is given in breathing technique, warm-up and posture flow. Students will develop body awareness, posture alignment and core strength in basic poses, while experienced students are encouraged to explore advanced variations in familiar postures. Everyone works to his or her own ability and comfort level. A mindful, soft flow of gentle asanas with attention to breath. Excellent for developing grace, flexibility, core strength, balance, muscular strength and stress reduction. For the beginning student or those searching for a relaxing yoga experience while exploring the details of breath and alignment. Hatha is an easy-to-learn basic form of yoga. Hatha Yoga is the foundation of all Yoga styles. It has become very popular as a source of exercise and stress management. The ideal way to practice Hatha Yoga poses (asanas) is to approach the practice session in a calm, meditative mood. Sit quietly for a few moments, then begin the series, slowly, with control and grace, being inwardly aware as the body performs the various poses selected for the practice session. Do not overdo the asanas or try to compete with others. Take it easy and enjoy. A class for those who are seeking to challenge their practice. Intended only for those with a regular vinyasa practice and who are comfortable working towards arm balances and inversions. 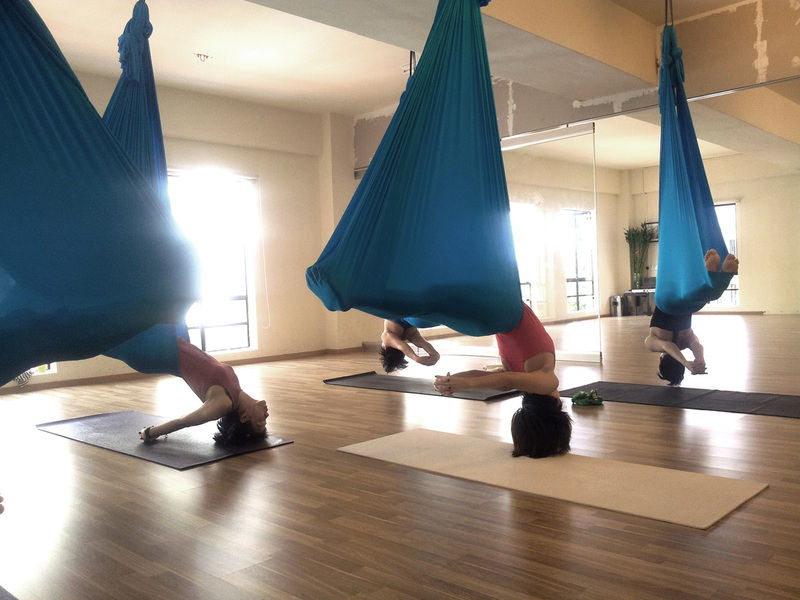 These classes presume students are familiar with intermediate yoga postures (including most inversions and backbends). In the (I-A) classes you will use your knowledge of postures and breathing techniques to practice exciting, physically demanding and challenging sequences and variations. The pace of these classes is faster and yet you will go deeper into the postures. Your teacher will help you achieve breakthroughs in your practice and your self-awareness. We recommend you have a year of solid Yoga under your mat before you join (Intermediate to Advance) classes. The reward will come for sure and you can expect to be transformed. A more challenging and vigorous led class with less basic instruction wil be given. The class will be focusing equally on strength and functional mobility, incorporating traditional yoga postures, inversions, and some dynamic movement. A certain amount of familiarity with the practice is required. Not for the fainthearted, these (A) classes are geared towards highly advanced students, teachers and freshly teacher training graduates who are seeking an environment to practice at their highest level. Most students at this level already have many years of serious yoga study under their mat. It is our strong recommendation that you will only take this class if you have an excellent degree of fitness and are regularly practicing the most difficult poses.